One of Britain's leading architects will visit Nottingham Trent University when it hosts a gala awards ceremony for the Royal Institute of British Architects (RIBA) East Midlands. Sir Michael Hopkins CBE - who was knighted for services to architecture - will along with his wife, Lady Patty, be guest of honour at the event on 15 May. 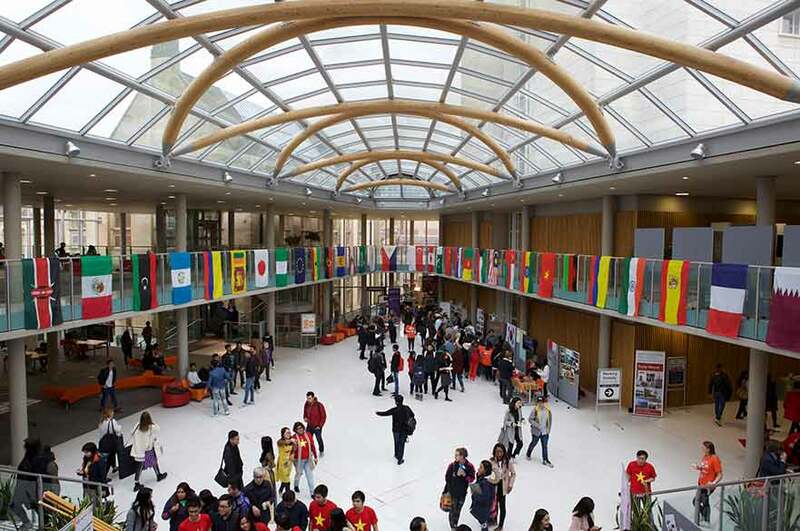 The awards ceremony will take place in the atrium at the University's RIBA-award winning Newton building, which Hopkins Architects designed as part of the £90 million transformation of the Newton and Arkwright buildings. A photography exhibition entitled 'Hopkins in Nottingham: Nottingham on Camera 1994 – 2014', by renowned photographer Martine Hamilton Knight DLitt (Hon), will also be on show during the event. Peter Westland, Dean of the University's School of Architecture, Design and the Built Environment, said: "It's an honour for us to welcome Sir Michael back to the building which he designed. "The Newton and Arkwright buildings are architectural icons in Nottingham and the atrium, which sits between them, will provide a fitting venue for the 2014 RIBA East Midlands awards ceremony. "We're thrilled that Martine's exhibition will be on show and we're sure that it will make for a fascinating backdrop to this exciting event." Sir Michael was the designer behind a number of British architectural icons such as the London 2012 Velodrome and Portcullis House in Westminster. Nottingham-based Mrs Hamilton Knight has specialised in architectural photography since 1990. Nottingham Trent University's new £60 million Students' Union building, in Shakespeare Street, city centre, is shortlisted for one of the RIBA East Midlands awards. For more details about Nottingham Trent University's 170 year celebrations, visit ntu170years.